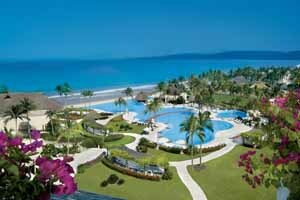 Beaches Resorts hosted the ever-popular Beaches Friends Forever B.F.F. 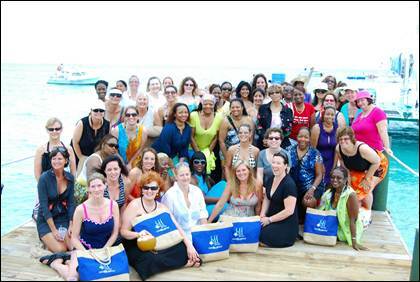 Girls Getaway from April 26 – 30, 2012. The Luxury Included® resorts for everyone once again offered this package for ladies looking to relax and enjoy a fabulous four-night getaway at the beautiful Beaches Turks & Caicos Resorts Villages & Spa in Providenciales, Turks & Caicos. This past week, B.F.F’s enjoyed a welcome cocktail reception, skincare classes, a beach-bonfire PJ party, private catamaran cruise, jewelry and wine soirée, seaside yoga and meditation, and much more. As a part of the B.F.F. Girls Getaway, these lucky ladies also received a $200 Red Lane® Spa credit, 10% discount at all resort gift shops, a free 5×7 picture, one complimentary Paul Mitchell® keratin treatment, a 10% discount off Dermalogica products at the Red Lane® Spa and a welcome goody bag, compliments of Beaches Resorts and participating sponsors including Harlequin Enterprises Limited, yogaspirit® studios, Colombian Emeralds® International, FitPregnancy magazine, SHAPE magazine, NaturalHealth magazine, Dermalogica® skincare, Paul Mitchell®, Creative Nail Design™, Be. Wine, Kinect™ for Xbox 360® and Island Routes Caribbean Adventure Tours. or just a Caribbean escape with friends! Additional B.F.F. Girls Getaway weekends are available from October 18 – 22, 2012, with rates starting at $1299 per person, or April 25 – 29, 2013 and September 26 – 30, 2013, with rates starting at $1399 per person. · Refrigerator in all rooms. · Luxury Family Suites enjoy the luxury of mammoth balconies and a sunken living area where the kids can frolic with excitement. · Pirates Island Water Park offering eleven slides for all ages. · Adults can share time alone, while the kids are pampered by their certified nannies in their Kids Camp, including a state-of-the-art XBOX 360® Game Garage featuring today’s hottest video games. Air conditioning, amenity kit, hair dryer, telephone, fan, private bath and shower, marble bathroom, CD/clock radio, cable TV, coffee & tea maker, safe deposit box, iron and iron board. All rooms contain mahogany furnishing and in-room refrigerators stocked with juices, water and sodas. PUERTO VALLARTA, on Mexico’s glamorous Pacific Riviera, is ideally situated between the majestic Sierra Madre Mountains and the awesome Pacific Ocean. This popular seaside resort town, made famous by John Huston’s film, “Night of the Iguana”, has been welcoming sun-seeking visitors for decades. Stroll along the cobblestone streets of the old town, where you’ll discover white-washed, red-tile roofed houses dripping with colorful bougainvillea along with an amazing array of enticing shops, cozy cafes and lively night spots. You’ll find several different resort areas, each offering a little something different from the other, including Old Town Vallarta, Marina Vallarta, the Boardwalk and hotel zones north and south of downtown. The destination is a perfect combination of sophisticated resort hotels (most situated along beautiful Banderas Bay) and captivating old-world Mexican charm. A perfect blending of Mexico’s natural beauty with a vibrant and colorful culture, Puerto Vallarta/Riviera Nayarit vacation packages offer something for young and old. Explore the palm-covered hills by mountain bike or desert jeep. Enjoy championship golf courses within easy reach of most hotels. Or discover the wonders of the deep on a sailing excursion or a scuba diving trip. Something for everyone!